Here is a quick follow-up to my previous blog post with the teaser about the upcoming Lotus Connections integration with Rational Team Concert that is being developed by Mainsoft. They’ve now made the integration available for download as a technology preview, and we asked Jonas Martinsson from Mainsoft to give us some updates for our jazz.net community. I’ve included his news below. In collaboration with IBM Rational and IBM Lotus, the Mainsoft development team is releasing a technology preview integrating Lotus Connections with Rational Team Concert. The technology preview provides direct access to your enterprise social network — including blogs, wikis, communities, activities, profiles and more — from the Rational Team Concert Web UI. Here is a complete list of features available in the preview. Most software development teams already collaborate on wikis, forums, and blogs as part of their daily activities. But accessing each of your collaboration tools separately, and having them disconnected from the Team Concert environment, often slows you down and makes you lose focus. We’re integrating the enterprise collaboration tools in Lotus Connections with Rational Team Concert to eliminate this disconnect. Find the people you need based on experience, skills, responsibilities or key relationships. Hover to see members’ social network activities and profiles, including their current local time. Search and stay up-to-date on project-related discussions in blogs, wikis, forums, and activities in your project community. Blog product plans or interesting technical problems encountered in your work. Store product slide decks and spreadsheets in the files collection. 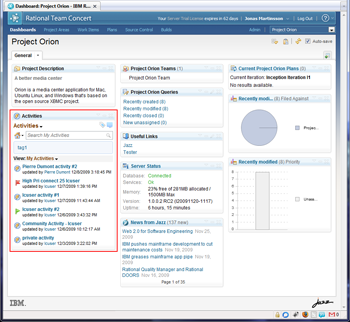 Publish work items as Lotus Connections activities or as status updates, to keep stakeholders and co-workers up-to-date. 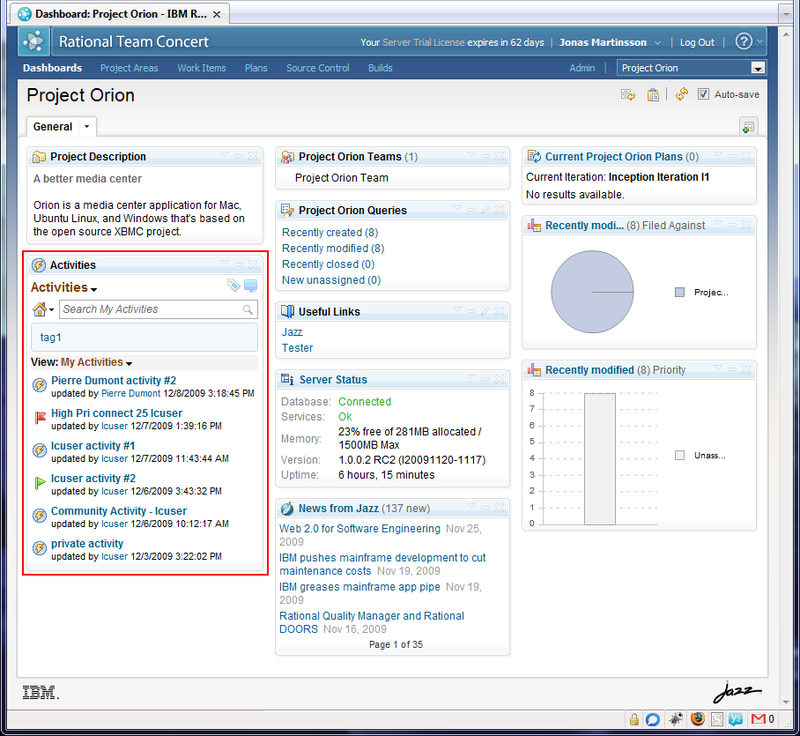 Search shared bookmarks to find out if the problem you’re working on has been solved already, or to find sites that deal specifically with project-related technologies You can also add project links, such as the work items database, to community bookmarks. 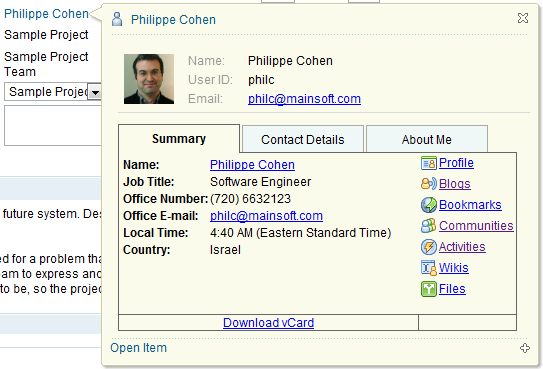 Hover to see team member's profiles from work items and dashboards. All public content is fully searchable and can be created without assistance from central IT or a Web master. From an IT perspective, authentication, authorization, and backup are already taken care of, eliminating the need for multiple, disconnected collaboration systems. Project members are automatically added to the associated Lotus Connections community, helping new team members to get quickly immersed and up-to-speed on the project they’re joining. Integrating enterprise social software into Rational Team Concert is particularly useful for agile teams in large, organizationally-complex environments. Rather than working in a self-contained silo, engineering teams can use social software to participate in an open channel of communication with non-technical stakeholders –- which is essential for scaling agile software development. Both technical and non-IT stakeholders, such as enterprise sales teams, legal experts, product marketing teams, and business partners participate on the same social network. There, you can easily keep everyone up-to-date on your projects, such as project deliveries or preparations for an upcoming conference. You can quickly find people to solve non-technical issues, such as a licensing question or identifying a trusted localization resource. And, you can interact directly with end users about product features using community forums. Typically, some of these posts will become defects and enhancement work items. Download the Technology Preview today! And, be sure to provide feedback on the jazz.net forums. Will access rights for users be synchronized/automatically updated between RTC and the project community?